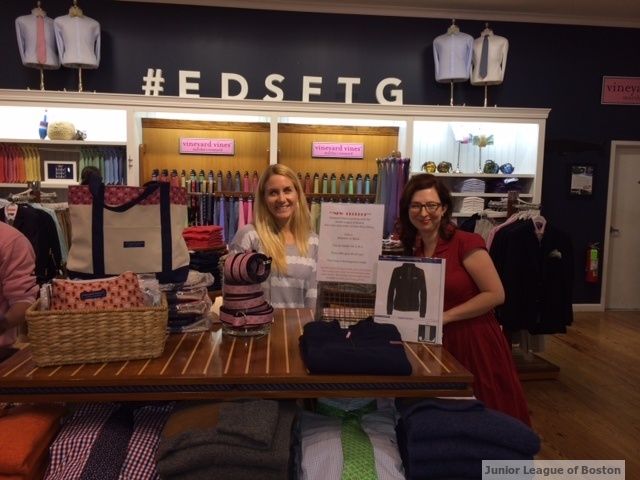 Making Junior League Projects Happen with Vineyard Vines - The Junior League of Boston, Inc. In the fall, I visited Vineyard Vines in Boston with friends and members of the Junior League for a fabulous shopping event. During weeks prior, Junior League member Shaina Walter a Co-Chair on the Small Events committee worked closely with Vineyard Vines to plan the event. I was excited to help Shaina Co-Chair and help with final details. If you like to enjoy the occasional Sunday Funday like I do, this was an excellent way to end a weekend! While we mingled and shopped around the store, we enjoyed a live band playing relaxing beach tunes. Guests enjoyed 10% off purchases and Vineyard Vines donated 10% of sales that night to the Junior League. There was a very friendly bartender serving up wine, prosecco, pumpkin beer and a delicious signature cocktail we named the Apple Cider-Tini. Guests sipped, shopped and snacked on barbq slider, chips and mini cupcakes. Vineyard Vines showcased their new line featuring holiday attire including sparkly tops and party dresses for the ladies and unforgettable holiday ties for the guys such as antlers on lobsters and beer mugs on skis! I bought a festive tie for a gift with adorable ice fisherman. The significant others who attended were able to keep up with the Patriots game which was displayed on flat screen in the store. Junior League member, Pamela Giasson and her fiancé had a successful visit finding their wedding day ties and groomsmen gifts! Krysten Hartman was very excited that she volunteered to help sign in guests because she won the raffle prize and Vineyard Vines tote! The Cookbook committee joined showcasing our signature Vineyard Vines apparel with the Junior League Logo including belts and the new Fleece collection. Junior League members Shannon Schell and Sarah Nelson were excited to have no flight delays coming straight from the airport suitcases and all! The event raised enough money to pay for the year’s cooking utensils for one of our Kids in the Kitchen locations!